Not long ago, amidst the joy of proud nations watching their respective Olympic athletes, Nike came up with an ad. Part of a series called “Unlimited”, the athlete featured in the 2016 Rio Olympics was an elderly Catholic nun, Sister Madonna Buder. By her story, she is a self-confessed late bloomer in triathlon, having first participated in her 40’s during triathlon’s infancy (it became an official Olympic sport in the 2000 Sydney Olympics). And of all her influencers, it happened to be a priest. Likewise, I’m not a stranger to persons above 60 who are very much into endurance sports. Somehow, I envy them. There are those that say teenagers have no money (of their own) but are prodded by parents to get into sports and various forms of recreation, given times off of school. The working people—anywhere from 19 to 60—have a lot less time for recreation due to their busyness. Then, the interested elderly who have a lot of time regained, are diving back into not only into sports, but games, crafts and many other fun things to do. But why? Is it for health, life and the upkeep of memory and faculties? Is it because they are reaping the fruits of social security? I would like to believe that there is more; that there is an even deeper wisdom behind recreation for old age—for all ages, actually! 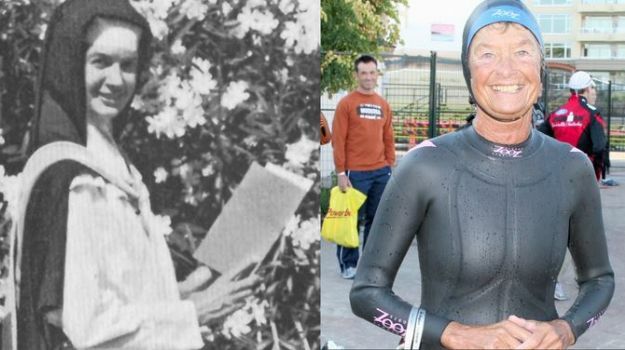 Those with an active faith life, like Sister Buder (who, at 86, has finished 45 Iron Man events, and opened new, advanced age groups), are looking into the bigger picture of life before she, herself, became larger-than-life (at least in the context of human achievements). Some would say that God would like to get more from them since the Almighty is a big—very big—investor. He expects returns, whatever those are—whenever those are. Let me just sum it up in two words: purpose and meaning. How we discover them and when is beyond us. But when we do discover them, we should be ready to reap the rewards. All things do work unto good, albeit not always how we want them to be.